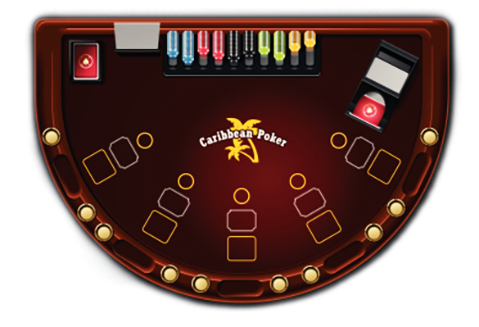 In Caribbean Stud Poker, you play against the dealer and don’t have to worry about beating other players’ hands. The game starts with each player making an ante bet, which depends on the table minimum. At this time the player also has the option of making an additional side bet for the bonus jackpot. Each player receives a hand with five cards facing down. The dealer's hand has four cards facing down and one card facing up. Players look at their cards and choose to fold and forfeit their ante bet, or call by making an additional bet. This bet is twice the size of the initial ante. If you are playing at a ten-dollar table your ante bet would be ten dollars and your call bet would be twenty dollars. After the players have bet or folded, the dealer's hand is turned over. The dealer qualifies only by having a hand with Ace-King or better. If the dealer does not qualify, the players are paid even money for their original ante bet and the second call bet is called a push - it does not win or lose. If your hand beats the dealer you will be paid even money for your ante bet and your call bet will be paid according to the following pay table. Learn how to play Caribbean Stud and maximize your chances of winning with this easy tutorial!